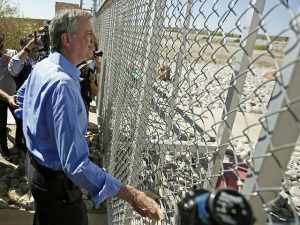 New York City Mayor Warren Wilhelm Jr. (stage name Bill de Blasio) visited the Mexican border to draw attention to the plight of immigrants. This is inhumane and Donald Trump is literally Hitler. I have come here because of this and only because of this. I am the mayor of New York City. And as the Mayor of New York City it is my job to be out of the city as much as possible. After all, I need national exposure if I’m going to get the nomination for president in 2020. I think I have a good chance at the nomination too. I’m white, lazy and incompetent. All traditions in the liberal wing of the party. That’s why I’m here. That’s the only reason I’m here. Our country needs Mexicans. New York City needs Mexicans. If we don’t have a steady supply of Mexicans who will cook the authentic Irish pub food at our authentic Irish pubs? The Irish? Have you ever eaten anything the Irish have cooked? Burnt beyond recognition. No seriously it looks like Jack Cassidy crawling across the floor of his burned out apartment. So I’m here on a mission from God. We need Mexicans in New York City. Authentic Mexicans. Preferably under 5′ 3″. For authenticity purposes. Not because it means you can pack more inside a truck. then demanded that the Mexicans in cages be released into his custody. New York City is an inclusive, tolerant city. We tolerate everything except for Republicans and Christians. But one of the things we are notorious for tolerating is Mexicans. We love Mexicans. All true New Yorkers love having their morning commute interrupted by serenading Mexicans on the subway. No, we love Mexicans and demand more of them. And I’m not just saying that because we’ve grown tired of Puerto Ricans and Dominicans. 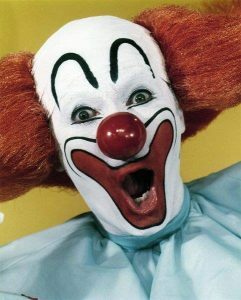 After Mayor Warren Wilhelm Jr. (stage name Bill de Blasio) was denied entry to the migrant camp the disappointed mayor complained of the humanitarian crisis to come. New York City is running out of Mexicans. Soon every Irish pub in town will have no Mexicans to cook for them. And if there are no Mexicans who will cook bangers and mash or shepherd’s pie? We are tampering with the laws of nature and nature’s God (if he even exists.) We are inviting chaos and a bangers and mash apocalypse upon our city! However after the cameras had left Mayor Wilhelm Jr. admitted the real reason he was in Texas. I’m just lucky to be out of New York City. The place is turning into a shithole. It’s like the ’70s again only without CBGBs and the cheap rents. Someone ought to do something about it! The mayor then left the border in search of a pub with shepherd’s pie. “There has to be a pub with Mexican cooks around here somewhere” said the hungry mayor.